Blockchain technology uses a sophisticated, tamper-proof, record-keeping database to help people verify their identity, allowing them to access a bank account, insurance, and many other financial services. Blockchain’s ability to give people control over their digital identities makes it an increasingly important tool in mitigating inequality around the world. People living without adequate records are often locked into poverty and exclusion. As many as 2 billion people worldwide are without a bank account. They tend to use only physical currency, making them vulnerable to theft. Furthermore, they cannot borrow money via a formal loan, nor can they access most insurance. Blockchain can correct this systemic failure that excludes too many from the economy by enabling people to get a digital identity. Simply put, blockchain is an open source digital ledger that acts like an accounting book and tracks all transactions. Everyone owns it but no one individual can make changes, making it tamper-proof. Blockchain allows people to prove their identity, enabling them to record transactions – and, hence, enter the global economy. The blockchain technology market is estimated to grow from 210.2 million USD in 2016 to 2,312.5 million USD by 2021 at a compound annual growth rate (CAGR) of 61.5 percent. This market is growing rapidly because of blockchain’s high adoption rate across various applications such as payments, smart contracts, exchanges, digital identities, and documentation. Barclays Africa and its UK parent company, Barclays PLC, completed the world’s first trade finance transaction using blockchain technology in September 2016. It saves a lot of time – typically these documents take anywhere from 2 to 10 working days to be delivered from party to party, whereas now it can be done electronically in hours or minutes. Our 2016 survey indicates, that financial inclusion using blockchain technology is not perceived as a market opportunity business, governments, and civil society have a high capacity to pursue. Furthermore, this market opportunity is also perceived to have a low impact on society. These findings signal blockchain is not a mainstream technology. Sub Saharan Africa, however, seems to be ready for blockchain to support financial inclusion, as leaders there rate it very positively. 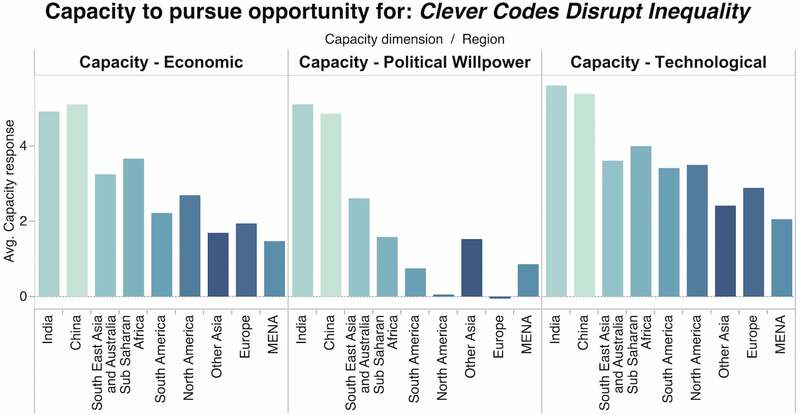 Regions containing clusters of countries that rank lower on the Human Development Index look more positively at the current capacity to develop this market and see a greater potential for it to make a positive impact on society. According to the 2016 survey, it appears the market is most appealing to respondents under the age of 30 as well as to women. Respondents in India feel confident the capacity (political, economic, and technical) exists to grow the market for blockchain-based financial products. However, in the rest of the world, the capacity, in all three dimensions (economic, technical, and political) to develop financial products based on blockchain technology is perceived to be low. The political capacity to grow this market is perceived to be particularly low in Europe and in North America in the eyes of leaders in these two regions. 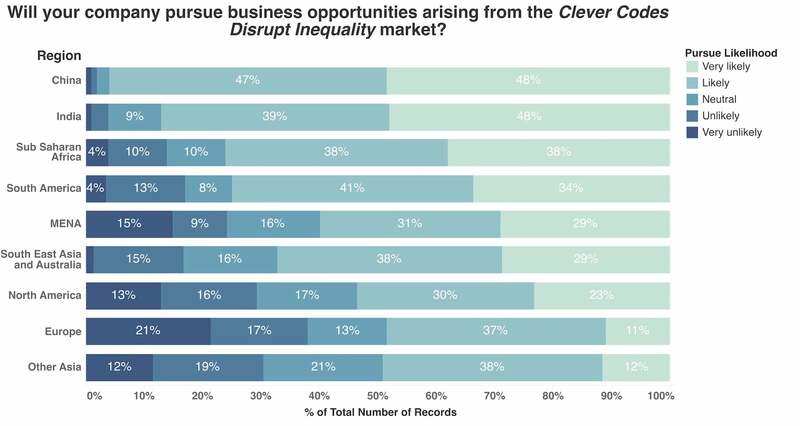 Compared to the 15 other market opportunities surveyed in 2016, business leaders have not expressed confidence in the strength of the business case of engaging in this market opportunity and they do not believe their organisations are likely to pursue it to the same extent as other opportunities. The exceptions are China and Sub Saharan Africa, where blockchain-based financial products are assessed more positively. Overall, this is the opportunity civil society is least likely to advocate for. The exception is, again, Sub Saharan Africa, where both government and civil society can be expected to actively advocate for this market.